Mike Tyson's Punch-Out!! 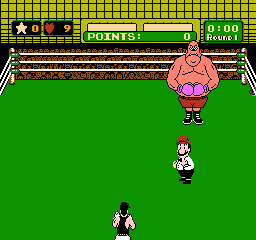 is the NES port/semi-sequel of the arcade game Punch-Out!!. 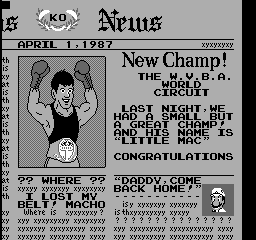 It contains a cameo from Mario, boxers that are obviously cheaters, and an out of place ad for the "Nintendo Fun Club" (later known as "Nintendo Power"). There is some different music between the international and Japanese releases. The original Japanese release, which was a golden limited-run edition, is essentially a modified prototype of the US version. 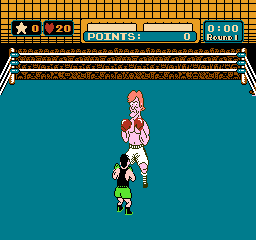 This can be identified as it has Tyson's graphics and coding, but he isn't accessible as the last fight is against Super Macho Man. 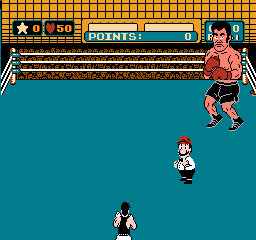 When the final US version of Mike Tyson's Punch-Out!! 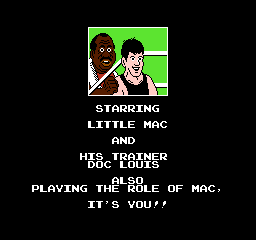 was released it had various changes, such as Mike Tyson becoming accessible and becoming the new iconic last boss. 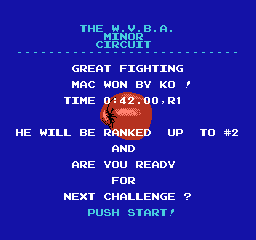 The title screen had blue text that read MIKE TYSON'S added to it at the top. 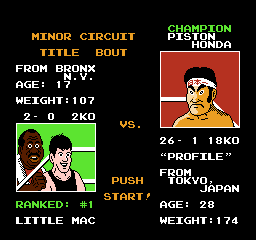 Some Engrish was corrected in Mike Tyson's Punch-Out!! ; TRAINNER was corrected to TRAINER, and the last sentence was cut in half. More Engrish fixing. 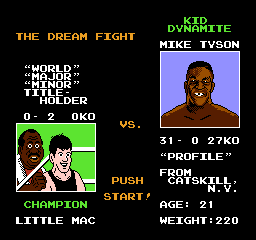 A dashed line had to be removed to fit Mike Tyson's name. In Mike Tyson's Punch-Out!! 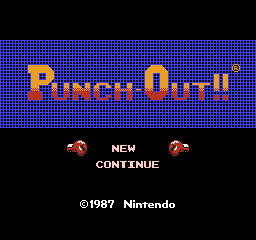 and Punch-Out!! Featuring Mr. Dream, there is a password to view the credits (106 113 0120, then hold Select and press A + B). 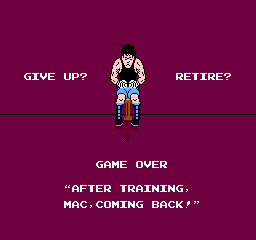 In the original Japanese release, this password was left unfinished. The original Japanese version contains all 6 secret passwords and has the routines to check it with the same button codes, but they are never called from the password check routine and there is no code to handle these after checking, as well as the credits display code. 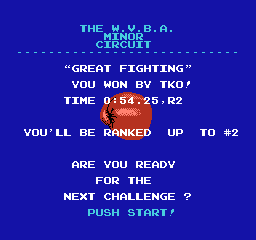 The credits text is present in the original Japanese ROM in the same place as in all subsequent version releases, but obviously rendered unused. 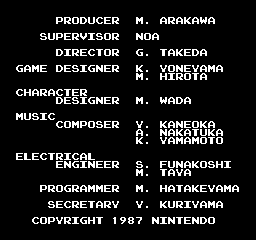 The difference between the original Japanese release and the other versions' credit messages is in two names: U.Kaneoka and U.Kuriyama in the original Japanese version were changed to Y.Kaneoka and Y.Kuriyama in all the other versions. The HUD and boxing rings in the original Punch-Out!! have a different color palette than the ones in Mike Tyson's Punch Out!!. The short demo is a bit different between versions and have yet another color palette not seen in-game. 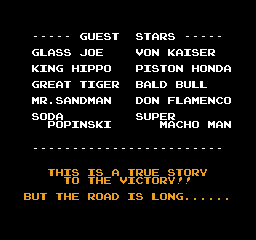 Piston Honda and King Hippo's skin color were changed from pinkish to yellow, as was Glass Joe's hair. The color palette on the profile images of Honda and Hippo was updated as well. 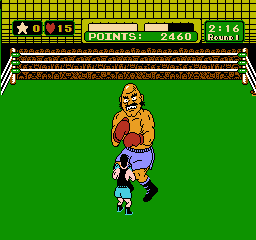 Bald Bull has purple colored shorts and boots in the Major Circuit, and blue ones in the World Circuit. In Mike Tyson's Punch Out!! he always wears light blue. 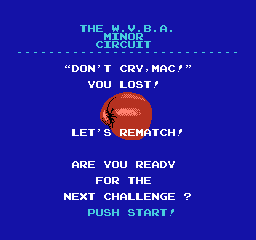 Even more Engrish fixing was done to the regular victory screen. 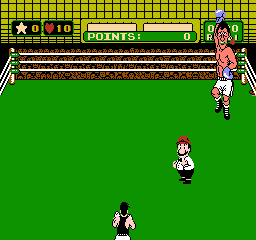 The Japanese version of the game is quite confused on who it should be congratulating. 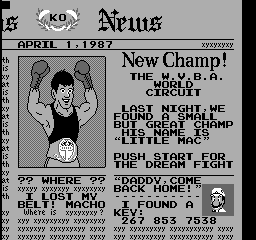 The newspaper at the end of the game was changed to tell the player how to fight Mike Tyson/Mr. 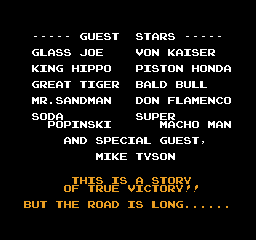 Dream, added a password for the Super Macho Man match, had its Engrish fixed, and changed the exclamation mark to be more blocky. You guessed it, more Engrish and second-person fixing. Document the PlayChoice-10 version, which has battery back-up and some other changes. 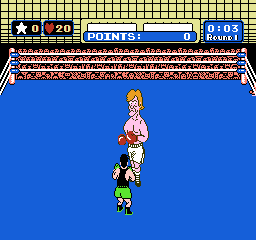 There's a glitch in the Super Macho Man fight that softlocks the game that was fixed in later revisions, add that here too. When Nintendo's license to use Mike Tyson's name and likeness expired, a different version of the game was released, replacing Tyson with a generic character named Mr. Dream. While this version is pretty rare on cartridge compared to the Tyson version, the Animal Crossing and Virtual Console versions of Punch-Out!! 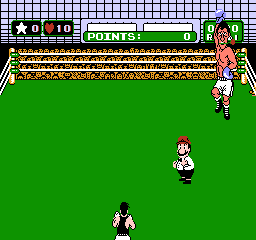 use this version of the game. The updated version removes MIKE TYSON'S from the title screen, as well as the "MIKE IS WAITING FOR YOUR CHALLENGE!!" screen. A second copyright year, dated 1990, was added. In with the Dream, out with the Mike. And here is Mr. Dream himself. He's basically just a palette and head swap of Mike Tyson, although at the same time based on former undeafeated record-holder Rocky Marciano. 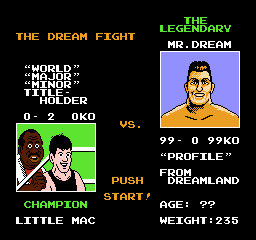 The pre-fight stats were changed for Mr. Dream, making them less realistic and more mysterious. 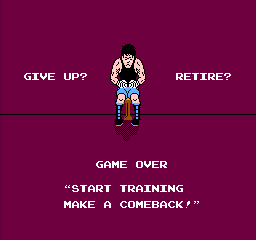 Piston Honda's quote in the NES versions, "Where is the NHK TV camera? Hello Tokyo!" 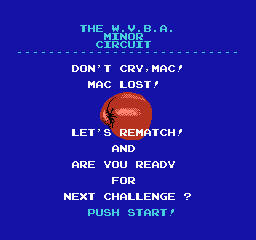 was changed in the Virtual Console version to "Where is my camera crew? Hello Tokyo!". NHK is an actual broadcasting company in Japan. 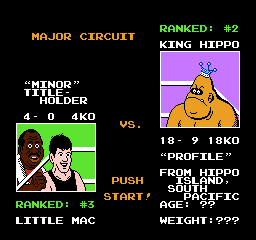 When used in the actual game, there are sound effects playing as King Hippo opens his mouth, this is the underlying track with no sound effects covering it up. When played back in the actual game, the first note is missing for some reason. 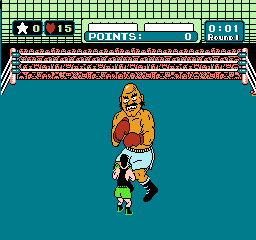 The "Oof" DMC sample from Kung Fu and Zelda 2 appears in the sound effects amongst the Laugh sound effects. This page was last modified on 2 March 2019, at 08:51.